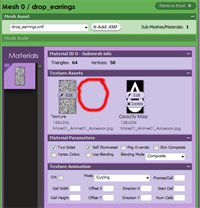 Step by step instructions on how to make a derived pair of earrings for the imvu catalogue. Learn how to make and upload a pair of earrings. All of the tutorial pictures open out to full screen if your unsure of anything, click a picture and take a look. Ok lets get making these earrings! Make sure you have the IMVU client open, that's the software you use normally to chat with others. Look at the main panel in the materials tab, it should be the first one open. The texture on the left is the one we want to change so click on the edit button. This will open a screen where you can choose a graphic to change the one currently being used. I want you to click on the Edit button and then go to the earrings folder you made on your desk top and select the new texture you saved. 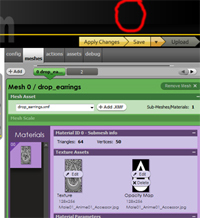 It will show a small thumbnail view of your newly selected texture. Cast your eyes to the top of your screen where it says. " Apply Changes - Save - Upload " and click on the Apply Changes. Now the avatar in the previewer will change and you can see how your new earrings look. If you don't like them save another texture and try that. Each time you change the texture, click apply changes again. CONGRATULATIONS! You are now ready to upload your new earrings! Look up the top again and the Upload button on the top right will now be activated. Click on the upload Button. Great Time For A Break! Clicking on the upload button will take you to the product submission area. Here we enter in information about the earrings you have made so IMVU knows what they are and users can find them when they search the catalogue. On the right you will see the add image button, click on this then go to the earrings folder and click on the icon you saved. Just go thru each section here adding the required information, once its entered the red "required fields" section will disappear and you will be able to click on the "Submit to Shop" button. Choose Location: Normally this will be set right for you so you don't need to do anything, if its not click the drop down boxes and list it in the right part of the category. Add Name/ Product Name: Put in a name for your earrings as they will appear in the catalogue. 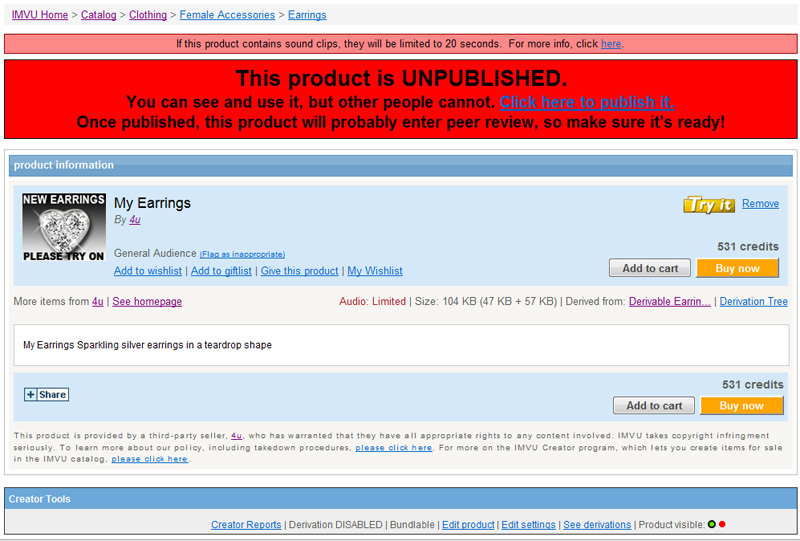 Choose Rating: For earrings this will normally be General Audience. Set Profit: Put in here how much profit you want to make per sale. As a guideline I would put 150-200 credits in here. Add Product Image: Icons are the little image you see when looking in the catalogue for something to buy. Use the browse button to go to the icon you saved in the earrings folder on your desktop, click on it and it should be added. If you know how to make your own make sure it's exactly 100 pixels wide and 80 pixels high and under 49k in size. Add Keywords: Write some keywords in that will help buyers find your product when they search the catalogue. Earrings, silver, gold, sparkling kind of thing, you can add upto a dozen. Controls : Make sure there is a tick in the "Visible in shop" tickbox, The Allow derivation from this product and Allow inclusion in 3rd party bundles you can tick or untick, they don't really matter when your starting out, they just allow or disallow others to derive from your product or include in bundles made by other people. 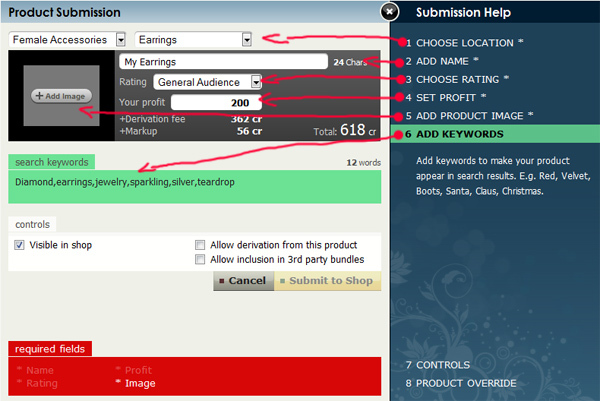 Once you have submitted the product it should open up the product page, in red you will see the publish area, click on this. This puts your product thru peer review. It takes about an hour for products to go thru this process, sometimes less or more. You can see your product instantly. Close off all the product editing windows in the client, go to your dressing room, click on your clothing inventory, go to accessories and hit the refresh button, then type in the name of your earrings, or just scroll to them if you see, click and put on. Other people will see your earrings in the catalogue usually after about 1-2 hours.